Mobile phones are the most popular everyday product and having a phone pouch is the surest way to protect them from wear and tear. 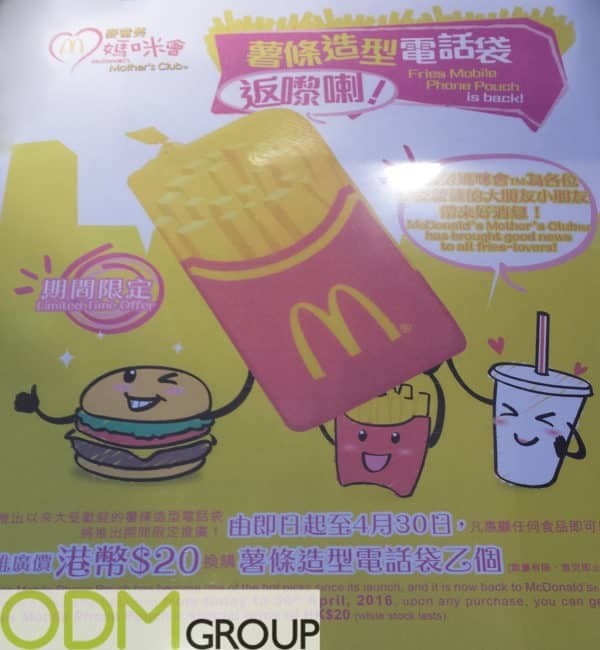 For ideas McDonald’s is offering there own signature fries branded phone pouch as part of their purchase with purchase campaign in restaurants. 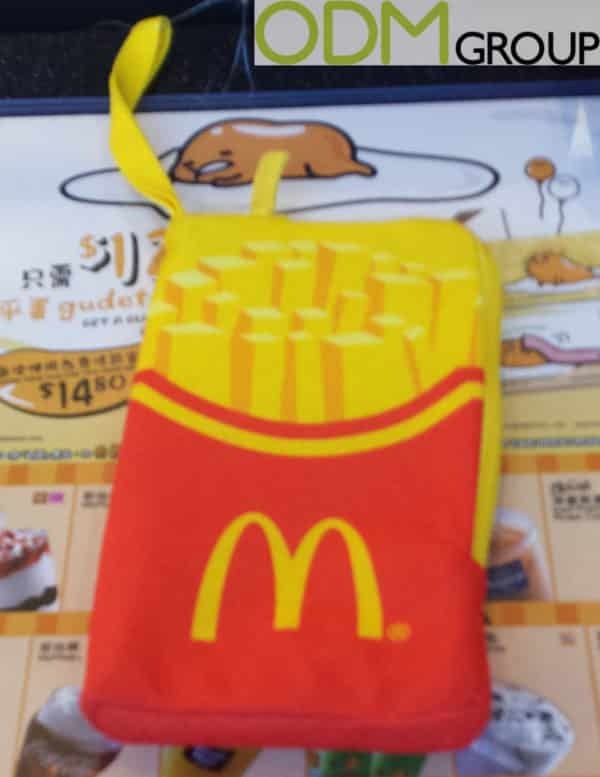 McDonald’s Fries Phone pouches have become popular around the world because of their unique and fun design. To get your own all you have to do it purchase a meal to get this promotional product for a special price of HK$20. Why we think that branded phone pouch is good idea as purchase gift? Enhances Brand Visibility. Young people are good trends setters in the promotional market. This pouch is fashionable and trendy meaning it will more likely be purchased. Trendy purchase gifts encourages your brand to be introduced via word of mouth and seen by the majority. Regarding McDonald’s promotional pouch it is further emphasized due to it being branded with a well-known brand. And people love using branded items. Boost your sales. McDonald’s can earn on the sale of these pouches, and it is good looking idea for advertising. Every time customers get their mobile phone out, they will feel hunger and the desire to buy fries. The constant appearance of your brand name would cause him to think of your brand more and hence want to buy more. The brand logo is well-placed. Mobile phone pouches are great because it can easily can be branded. In this case McDonald’s choose their fries box as the pouch design, something we are all familiar with. After designing the pouch, this item can be used as a gift with purchase, on pack promo or as a general marketing gift. Other brands could also use this example of to help boost their own brand exposure. Here at ODM we have significant experience in manufacturing and designing all kinds of promotional products. If you are looking for marketing idea or promotional product for your business please feel free to contact us today.